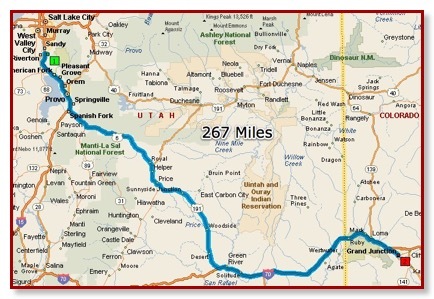 We left Draper, UT (just south of Salt Lake) around 9:30 and headed south to southwest. After dealing with the traffic and construction around Salt Lake, we escaped it as we turned onto Rt 6 (from I15) only to run into some stop and go construction within 10 miles. Once past that, however, it was smooth sailing all the way to Green River, UT. Green River is right at the junction of I70 and 6. It’s a quiet jump-off town since it is where decisions have to be made. Shall we head to Salt Lake, Las Vegas, Phoenix, Reno, Moab or Denver? We topped off our tank since I70 is inundated with winds and if the fickle winds opted to blow from the east, it would be painful to our fuel economy. Now that I mention it, we have been getting upwards of 13 MPG for the last 3 days and have been thankful for the super mileage and the reasonable fuel prices. We arrived in a nice campground on the western side of Grand Junction at around 5:30. The construction that we had encountered had delayed our arrival by about an hour. After we got set up and rested for a few minutes, we had to run out and see if we could track down some fresh, local peaches. We had travelled through this area about this time and found a spectacular roadside stand with bushels of peaches. This time, we failed to find any. We returned and did some weather research to determine the route of our final leg. We could go southwest on route 50 through Gunnison or I70 over Vail Pass and Eisenhower Tunnel. I70 was the winner with some small snow risks at Vail.